When Morocco is mentioned, people always think of Marrakech. This vibrant city is the most popular destination in the country, thanks to budget carriers that have direct flights from various cities in Europe. After Fez, we were ready to face the touts at Djemma El Fna Square and the souks. Orange cart at Drjemma El Fna square. The freshly squeezed orange juice is really yummy! 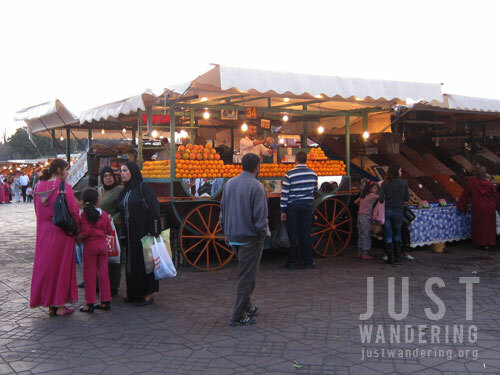 As the petit taxi drove through the gates of the medina, we eagerly took it all in, the crowds, the traffic, the noise. It was the complete opposite of Ouarzazate. After the driver insisted we pay more than what the ride should cost, we dragged our luggages down the street beside Cafe de France, the favorite meeting place of tourist and guides in the medina. As soon as I whipped out my iPod to look at the map, touts came to offer to show us the way. Waving them off, we continued walking, following our instincts and finding the derb where Amour Riad is. We rejoiced upon learning that there are no stairs to contend with to go to our room, but our elation was short lived when we realized that the only thing that separates the toilet and shower from the tiny room is a curtain. Still, the location is excellent: only 7 minutes walk from the square, and there’s a small sari-sari store at the entrance to the alley where I was able to buy a 1-liter bottle of water for only MAD 5. 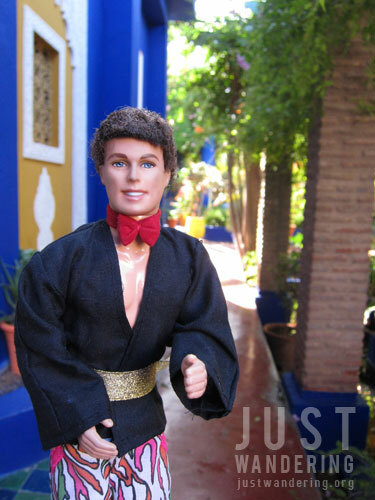 Though we had plenty of time in Marrakech, we were only able to make it to one major tourist attraction: the Jardin Majorelle, a 12-acre botanical garden that pay homage to Yves Saint-Laurent, who owns its. A nook in the garden has a memorial to the designer, while a small gallery holds various original artwork. When the medina gets overwhelming, this is a lovely place to soak in some peace and quiet. After the gardens, we walked to a nearby supermarket to buy some supplies. It was fortunate because the rain started pouring. We stayed inside to wait for it to end, and after about an hour, we head back out to get a petit taxi. They were grossly overcharging us, so we decided to just walk until we find another taxi that would take us back to the square. We walked and walked until we found ourselves outside the medina walls. After walking for about 30 minutes, we were back in the souk. In Marrakech, we mainly stayed in the square, shopping. There were a lot of pretty things in the souks. Colorful scarves, leather bags in different shapes and color, and shiny tea pots with colorful glasses. In our first venture into the souk, we were after one very specific store: the Assouss Argane Marrakech. Actually, it’s Assouss Cooperative d’Argane in the Lonely Planet guide. We followed the directions in the book and promptly got lost. It’s in the general vicinity of the area where the book says it is and has the same address, so I’m betting it’s the same. So why all this effort? 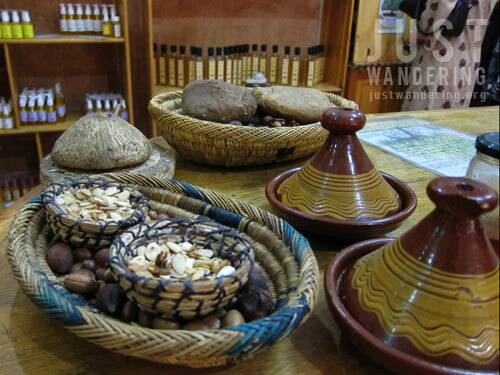 Argan oil comes from the nut of the argan tree, which grows only in Morocco. This makes the oil very rare and expensive. It is used in cosmetics (as an ingredient or used directly on skin) or in dishes (just drizzle on your food, no direct heat). I asked around and found out that a small bottle of cosmetic grade oil goes for Php 1,500 in Manila. Cla and I hoarded bought 60mL bottles for more than half the price. Braving the souks and finding that shop gave us the confidence to find our way around. True enough, we made the same trip (though through an easier path) the following day to show Lilliane, who happened to be in Marrakech. It was great to meet her again and ask her about her round the world trip. 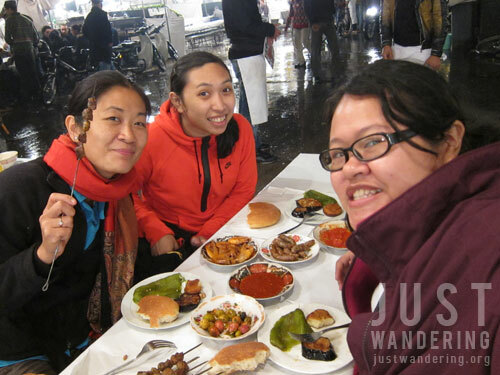 We had dinner with her Couchsurfing host on our first night, then spent the following day shopping in the souk. Because there were three of us, it was easier to bargain because there were three of us buying in the store. That and the fact that Lilliane has mastered the art of haggling. For dinner, we finally ventured into the Djemma El Fina night market. Touts are very aggressive here, each one trying to outdo each other’s offering. We chose the stall with a very affable waiter, who promised us that one order of brochette has 6 sticks, unlike the others who only serve 5. Aside from the usual bread, we also got complimentary olives and “salad,” which comprised of a couple of dried aubergines and grilled green capsicum. Most of the stalls (and most of the local restaurants actually) offer practically the same menu. They vary only in price, size of the serving, and what comes free with it. There are stalls that have mostly tourists as customers — chances are, the servers would be able to speak to you in English, and there are stalls that are mostly filled by locals. You’ll probably get the menu with the tourist prices, and you might have a hard time talking to the servers, but at least you’ll get a taste of the local fare. 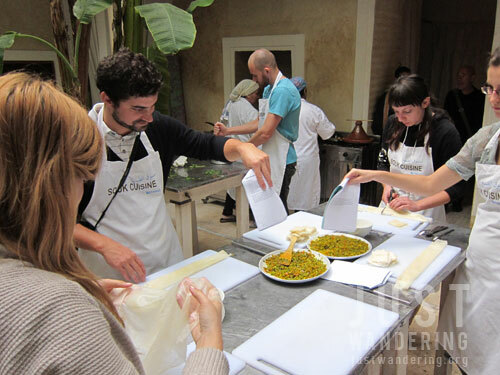 If you’re really into Moroccan cuisine, one thing you can do is attend a cooking class. There are only a handful of names that pop out when you do a Google search, so I went with the one that fit my budget. 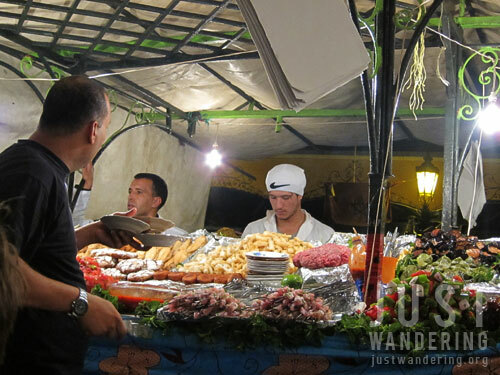 Souk Cuisine is also recommended in the Lonely Planet, has a lovely website, and the clincher: it includes a trip to the market. We assembled at the Cafe de France, and headed into the souk to buy the ingredients for what we’re cooking that morning. We were handed a wallet with money in it for the goods — we had to select the produce ourselves and haggle with the sellers. We were led out to where the locals buy their food: in the open market where the vegetables are put on top of mats laid down on the ground. Parang namimili lang sa sidewalk. I had to smile because it was exactly like the markets here in Manila, crowds and mud included. On the way to where the class will be held, we stopped by the community oven for some freshly baked bread. Since not all household has its own oven, they would bring their dough or tangier here to bake and cook, then pick it up after a couple of hours. We settled down and have some olives, bread and tea while the bounty from the market are cleaned and prepared. Gemma, divided us into groups and given tasks. Some chopped, some mixed ingredients, some took turns frying sliced aubergines. It was a very hands-on class, which makes it all the more fulfilling to dig in to our late lunch. Despite the chaos, the touts (watch out for the henna ladies), and the rain, Marrakech won us over. We haven’t been able to see a lot of must-see places, so I guess that means we have to go back? Nina! How do you know if Argan oil is authentic? I’ve seen a lot sold here, but hesitant to buy because of authenticity…hehehe! Bakit… gwapo yung nagbebenta ng food nyo sa market. *A*) Marami bang gwapong ganyan sa Morocco? May nilandi ba si Prez! dream destination ko to. kainggit teh! so jealous. always intrigued at this place. but too expensive are the trips from us. I sooo feel you Nina! We’ve been here for 8 days and all we do is drink mint tea and eat at Djemaa. I don’t even take photos. Lazzzy. ang sarap naman sumama when you go back!